When Mr. Freeze showed up on The Batman, fanboys were incensed - the classic interpretation of a noble scientist trying to save his wife was re-imagined as a simple jewel thief who happened to have a frigid M.O. A fair complaint, to be sure, except for one thing: that "classic" version was completely invented for the Paul Dini/Bruce Timm animated series. Before that, in the comics, Mr. Freeze was originally Mr. Zero, a jewel thief who happened to have a frigid M.O. Even his origin is old school, finding its inspiration in the live-action Batman tv show. Back then, Batman accidentally spilled cryogenic chemicals on Dr. Schivell, creating his newest foe; on The Batman, Bruce chases a jewel thief into a cryogenic lab, and accidentally causes the guy to be electrocuted and frozen at the same time. Of course, on the old show, the guy didn't become an undead freak who generated cold around himself - gotta have a few updates, after all. The character's motivations may have been entirely retro, but his design isn't. He manages to look even icier than the BtAS Freeze, though his design is influenced by that version - consider him a stylistic extension of Mike Mignola's designs for The New Batman Adventures. Black suit, blue highlights, big collar and backpack, all that. Of course, he shares The Batman's usual design sense: big square feet, sleek lines and a general ninja-y feel. In a neat move, there are translucent patches on his upper arms, cast in a light blue for that chilling appearance. There's some blue piping on the costume, and his huge collar is more of a Williamsburg Blue. Thick tubes connect from there to his angular backpack. The rest of the costume is pretty much smooth black, though there is a patch of blue (skin?) on his chest. According to the official character model sheets, they missed a few paint apps: a thin blue line immediately beneath the chest, grey for the soles of the boots and blue for the palms of his hands. It's an easy enough fix, but we shouldn't have to fix it. Overall, the design is very simple, but has a really nice graphic quality. It wouldn't work in the comics, but it's great for animation. The old glass head dome is gone, replaced by a frozen chunk of ice. 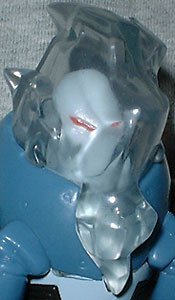 Freeze's head is sculpted inside, but since his face was obscured in the cartoon, it's not highly detailed - more of a "head-shaped object" than an actual cabeza. All we can really see are his thin red eyes, floating on a blue-tinted lump. It's a good approximation of what the cartoon was trying to convey, and a really cool design. The "ice" is soft plastic, so you won't hurt yourself on all those spikes. There was a variant figure with a bit more detail - a sculpted nose, for instance - but it's not a huge improvement over this. Mr. 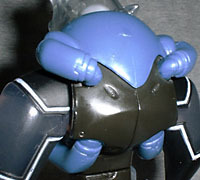 Freeze is under-articulated, even by this line's standards. He moves at the shoulders, hips and waist. You can understand why there aren't any elbows - clear plastic is generally weaker and more prone to breaking than the solid stuff - and no neck, but no knees? Nothing? Seems like a gyp. We do get a halfway decent accessory, though. 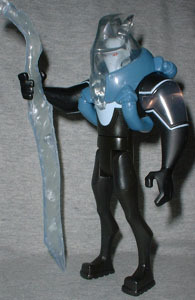 Freeze has a 6 1/4" icicle/sword thing, which would normally be pretty dull, but it's got a nifty play feature. The thing is filled with some chemical that freezes nicely - it gets cold quicker than water and stays chilly longer. Finally, an ice-based character can actually have an ice-based accessory that won't melt all over your shelf. Excellence! Mr. 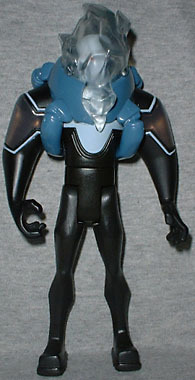 Freeze was unspeakably hard to find when he was originally released, since he came out before Mattel started to get their act together. Luckily for you, Mattel has just sent him back to shelves on the new EXP card with a free DVD on the front of the blister. While this scheme of re-releases generally means that the figures that didn't sell before will now have the chance to not sell again, Mr. Freeze is the exception. This is a nice toy, with a great design and a simple but impressive accessory. No one really got a shot at him the first time around, so don't pass him up now. You don't have to be a fan of The Batman to dig this ice man.